We have plenty of nifty nature events on tap for April, beginning with a DeKorte Park bird walk at 10 a.m. on Sunday, April 7. The park should be open until 3:30 p.m. that day. Our Third-Tuesday walk is in Harrier Meadow. Both events are sponsored by the Meadowlands Commission and the Beregn County Audubon Society (BCAS). We are also hosting the BCAS' Birding for Beginners series on three Sunday afternoons in the Marshview Pavilion at DeKorte Park. Enjoy early April out of doors by joining us on this free two-hour guided nature walk in DeKorte Park in Lyndhurst. We’ll walk around parts of the park, looking for spring arrivals, Bald Eagles and other birds. The walk starts at 10 a.m. outside the Meadowlands Environment Center. 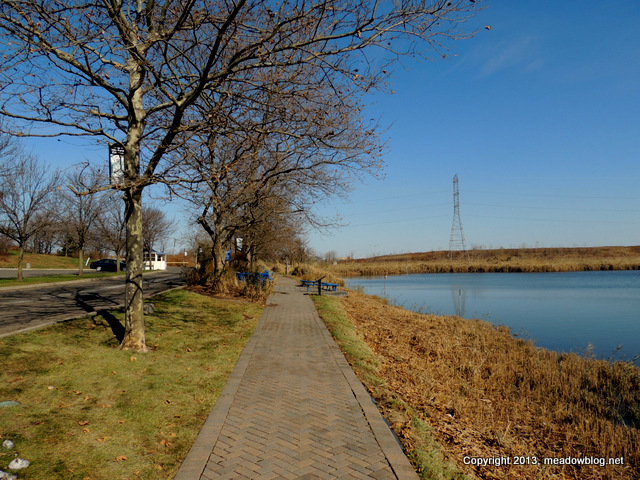 The walk is run by the N. J. Meadowlands Commission and the Bergen County Audubon Society. Check meadowblog.net for last-minute weather updates. You will have to sign a standard liability release that is good for NJMC/BCAS events throughout the year. To rsvp, contact Don Torino of the BCAS at greatauk4@aol.com or 201-230-4983. Sunday, April 7, 1 p.m. This free two-hour Birding for Beginners class starts with a short session on basic bird identification at the Meadowlands Environment Center in DeKorte Park in Lyndhurst, followed by a nature walk in the park. The event is run by the Bergen County Audubon Society and hosted by the New Jersey Meadowlands Commission. You will have to sign a standard liability release that is good for NJMC/BCAS events throughout the year. To rsvp, contact Don Torino of the BCAS at greatauk4@aol.com or 201-230-4983. Sunday, April 14, 1 p.m. This free two-hour Birding for Beginners class starts with a short session on birding optics – from binoculars to spotting scopes -at the Meadowlands Environment Center in DeKorte Park in Lyndhurst, followed by a nature walk in the park. The event is run by the Bergen County Audubon Society and hosted by the New Jersey Meadowlands Commission. You will have to sign a standard liability release that is good for NJMC/BCAS events throughout the year. To rsvp, contact Don Torino of the BCAS at greatauk4@aol.com or 201-230-4983. Tuesday, April 16, 10 a.m. -noon. Celebrate the end of income-tax-filing season with this Harrier Meadow spring bird walk in North Arlington. We’ll walk around the 70-acre natural area, which is normally closed to the public, and look for Ospreys, early warblers and shorebirds and a snipe or two. The walk starts at 10 a.m. at Harrier Meadow, on Disposal Road near Schuyler Avenue. ( Note: There may be weekday construction vehicles on Valley Brook Avenue, so Harrier Meadow may be best reached by Schuyler Avenue). The walk is run by the New Jersey Meadowlands Commission and the Bergen County Audubon Society. Check meadowblog.net for last-minute updates. You will have to sign a standard liability release that is good for NJMC/BCAS events throughout the year. To rsvp, contact Don Torino of the BCAS at greatauk4@aol.com or 201-230-4983. This free two-hour Birding for Beginners class starts with a short session on field guides at the Meadowlands Environment Center in DeKorte Park in Lyndhurst, followed by a nature walk in the park. The event is run by the Bergen County Audubon Society and hosted by the New Jersey Meadowlands Commission. You will have to sign a standard liability release that is good for NJMC/BCAS events throughout the year. To rsvp, contact Don Torino of the BCAS at greatauk4@aol.com or 201-230-4983.